Bunny is not in the mood for your shenanigans. I have been enjoying the company of my two lovely rabbits for the past year and a half and my only regret is that I didn’t take the leap (take the hop?) sooner. Their intelligence and their willingness (and patience) in communicating is endlessly fascinating. Their gentleness (and occasional ruthlessness) and resourcefulness is a joy to experience and a reminder to keep my mind open and aware, always (whether in motion or in stillness). 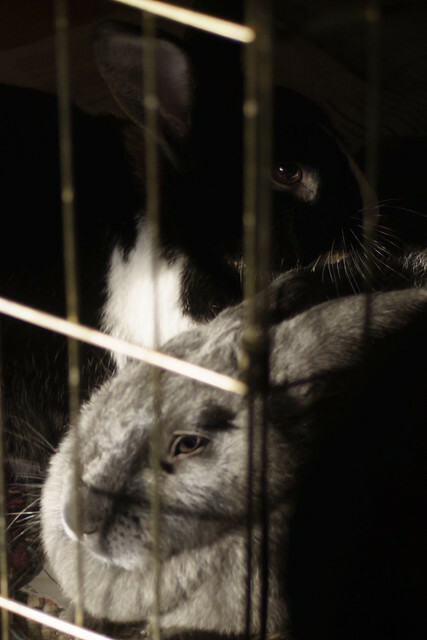 Too many dispose of their pet buns because they have unrealistic expectations about bunny behavior, the responsibilities of keeping a rabbit, and too many declare bunnies to be boring or not interactive enough or too timid/scared/defensive (usually because the pet has been outside in a hutch or neglected in a too small cage. READ MORE from Rabbit.org and check out the video below from Howcast, featuring bunny mama Amy Sedaris and Mary E. Cotter. The video does have a typewritten transcript, if you scroll down and click “show more” just below the video, when viewing it on youtube.com). If you have any anecdotes about your pet bunny/bunnies communicating with you, please share them in the comments. I will be sharing a few of my experiences, with Frank and Otis, when I can (including video and still images). Frank is picking up and dropping their salad dish on the tile floor. At least this particular message doesn’t involve bunny pee (thankfully that is a rarity since I had Otis spayed and since I figured out that they were strategically urinating in spots that required opening their pen door as I couldn’t reach the puddles without, which allowed them an opportunity to escape and binky like mad throughout the apartment, as though laughing at me. As though. Because they were laughing at me. After the second time, I figured it out. They are now contriving newer, sneakier levels of “trick the humans”. What can I say? I was new to the whole bunny thing, and that was my big wake up call that I was dealing with individuals more clever than I had ever imagined. ).